Guttering is an important part of a house or buildings structure. Proper maintained guttering can save a building from excess water from rainfall damaging the walls, both internally and externally. If left to continue, walls can begin to decay, damp can spread to internal walls and pest infestation can occur. With the use of well-maintained gutters, this can be prevented cheaply and constantly. There are many things that can be seen when a gutter system needs repair. Many of the signs can be seen early on and if noticed, should be addressed immediately when possible to avoid any costly or long lasting damage to a building. After a fair amount of rain, it is wise to examine the gutter system to notice any leaking or overflows. By doing this, you can identify any issues before any damage is caused the property. Also, keep an eye out for any overflowing which could be caused by blockages may lead to ground erosion or marshy conditions. From prolonged exposure to these conditions, walls can and will begin to absorb the moisture. Creating pockets of damp and mould that may lead to health issues from prolonged exposure or crumbling walls which would weaken a buildings structural integrity. Other indications that a leak or an overflow has formed can range from many different pieces of evidence that can lead to the area of an issue and a possible type of issue at hand. Keep an eye out for external walls that have begun to become damp, stained or slimy. Depending on the location of the evidence, this could indicate a minor leak which has begun to collect and drip from a lower part of the guttering system to a larger leak that is losing a high volume of water to quickly to be taken away and disposed of as intended. Another piece of evidence to be considered are puddles that have formed. Once the ground has dried but a puddle of various sizes still remains for extended periods of time, this will mean that a leak has formed which is slowly dripping backed up water forming a puddle below. This indicating that a small crack or slight gap may have occurred within the joints or sealants. Other causes may be poorly aligned gutters, either from bad installation or from extreme environmental weather like high winds or physical damage from swaying branches. While most signs can be seen, the smell of damp from internal rooms are another indication of an issue of damp from a faulty guttering system. Despite this, caution must be taken when maintenance is performed, both personally and when a professional is hired. Working on gutters involve the use of ladders which must be firmly secured to the ground as a fall can lead to extremely serious injuries, particularly with gutters installed high up. 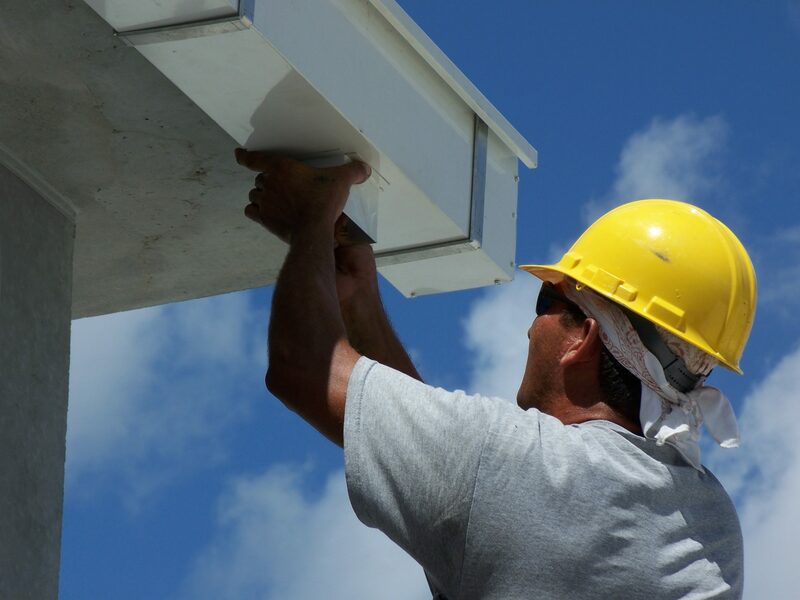 Repairing can be done personally or by a professional, small jobs can be carried out personally if you are confident to ensure the continued usage and longevity of a guttering system while large jobs should be carefully undertaken or should be given to a professional to be carried out. Consider the material as well. Heavy materials like steel that require a reapplication of sealant which may be too much for an inexperienced person to carry out while materials like PVC are extremely light as well as easy to handle when sealant needs to be reapplied. When a leak has occurred around a joint, the first step which must be taken is to let or remove any water within that section as well as any debris or dirt which would get in the way or obscure your exanimation. Once removed, inspect the sealant for any wear and tear that may have been afflicted from time or physical damage. If there is no damage, consider checking for any sagging in the pipes leading to the joint. A possibility is that some of the brackets have become lose or needs additional support which has caused sagging to occur in the guttering system. If the sealant has become damaged and is the cause of the leak, carful remove the sealant using a flat headed screwdriver before replacing with new sealant in the same area before using a gloved finger to smooth over the newly placed sealant for a smoother finish whilst ensuring that no gaps remain. When there is a leak around a union piece, then a gasket may be damaged inside. To reveal and replace this gasket, you must squeeze the gutter to remove the union piece before peeling away the damaged gasket with a new one. If after repairing, sagging continues with water pooling up and overflowing, had more brackets along the gutter segment to add support to remove the sagging and the issues it causes. When water begins to overflow from a hopper head, this usually indicates that there is a blockage within the hopper head. An indication to the seriousness of the blockage can be found when it begins to overflow verses the amount of rainfall. If the water begins to overflow after extended periods of time during heavy rainfall, this will mean that blockage is relatively small, only causing a small reduction of water flow within the pipes whilst, during light rain fall. Overflowing would indicate a large blockage preventing all water from proceeding to the rest of the system. Fixing this issue is a simple task and be undertaken personally. Initially, checking and removing any debris caught in the hopper head may remove the overflowing issue without the cause of more actions needed. Once done, check the hopper again during another session of rain. Overflowing will continue if another blockage is still in place further down within the system. Removing this blockage can be an easy task but professionals may be more experienced if dealing with high up areas for safety reasons. Depending on the location of the downpipe that leads from the hopper head, you may be able to covering the drain and using a simple garden hose with the water turned on. Guide the pipe up the drain until a blockage is felt, use the garden hose and tater to attempt to dislodge the blockage within allowing it to fall down the pipe. Be prepared for water to follow once the blockage to follow. If this does not work or another blockage is in place further above, the use of drain rods from the top can dislodge any blockages beyond the reach of a garden hose or more stubborn blockages. Attempt to rotate the draining rod clockwise to aid in removing the blockage for more effective clearing. Prevent dislodged debris from the blockage from entering the drain with a simple rag cloth or towel to cover the bottom of the downpipe. Proceed to scoop out any debris that would cause a blockage with a trowel or with a gloved hand before removing the rag and rinsing the gutter and downpipe with water to ensure any remaining debris is washed out and is working efficiently. Checking the downpipes connecting bolt should always be the first step. This is because it is the easiest repair possible when fixing a loose downpipe. If a connection bolt is missing, simply replace is with a galvanised bolt of the same size. Although this may be a reason for loose downpipes, it is not the only cause. Another issue that can cause the same effect are missing or loose wall plugs that have loosened due to weather. Simply replace the missing wall plugs if needed or tighten any loose wall plugs to make the downpipe sturdy once again. Replacing guttering that uses lightweight materials like PVC can be done personally but heavier materials like cast iron or steel should be taken carefully and is often left better to professionals due to the weight, handling and height. Begin by adding large nails beneath the gutter into the fascia board to support the gutter whilst holding it in place when removing to reducing the chances of the segment of gutter falling. 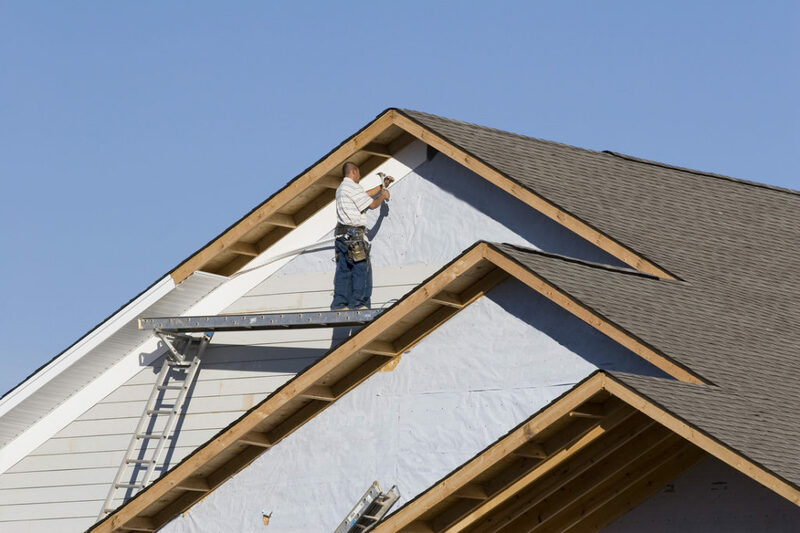 Once complete, remove any bracket that is keeping the segment of gutter attached to the fascia board, cutting through the nails can be done if needed and tapping it on one end with a hammer to dislodge it. Afterwards, tie a rope to that end before breaking apart the joint, unscrewing any brackets that where supporting the piece of gutter to the fascia board. Once done, tie a rope to the other side then slowly lower the section to the ground to prevent shattering or damage to the pipe or ground below. Continue with this process until all piece s of gutter that need to be replaced have been safely removed. When replacing the pipe, fit a gutter bracket towards the top of the fascia board at one end of the guttering with sting tied around the base of the bracket. Use the manufactures information to ensure the use of correct size and number of screws to securely hold the new gutter before commencing. Ensure that everything measures correctly and can be joined before commenting with the replacement. Using the string that was tied to the base of the bracket, check that the string is at a slight slop to ensure water travels down the gutter towards the outlet, roughly 10mm for every 6 meters. Mark all the other brackets that will need to be installed along the sting, no more than 800mm apart for slandered roofs to 600mm for roofs with a steep pitch, 150mm for any joints or fittings. Once marked and measured, begin to fit all the newly marked brackets. Using a union piece at the start, begin fitting the pieces of replacement guttering, using joints where needed. When you reached the end, cut any excess guttering before placing and finishing the final joint. Downpipes are installed differently, but the principals remain the same. Using a spirit level to ensure a perfect vertical line, mark where the downpipe will lead down from the outlet to the drain. Holding a downpipe clip over the vertical line, begin to mark the fixing holes on the wall to that their locations will be marked when the downpipe clip is removed, beginning with the first downpipe clip which will be located 10mm below the outlet. Do this down the line for at least every 1.8 meters down the wall until you reach your desired length at the bottom of the wall. Using a drill and sturdy, secured ladder, drill into the fixing holes with the recommended size that the manufacture states. Insert wall plugs into the freshly made holes. Starting at the top, Fit the first downpipe segment to the socket, proceed to fixing a socket clip over the join and screw in securely to the wall plugs behind. Continue doing this down the vertical line ensuring all socket clips are fastened securely before reaching the bottom. For the last piece of downpipe, fit a shoe piece to the bottom of the piece so that any water sent down the system will be directed towards the drain before finishing with one final socket clip.